The following are official forms of The Grand Lodge of Alberta and are intended to be downloaded for the use of Lodges within the jurisdiction. Form 102 Information for Applicants. Freemasonry - Aims and Objectives. Folds into an informational pamphlet designed for someone who has expressed interest in the Fraternity. Form 103 Letter for Potential Applicant This letter must be read and signed by any potential applicant prior to them being issued with a Petition for Initiation..
Form 104 Petition for Initiation This form must be completed in full, signed by the Petitioner and two brethren of the Lodge handling the Petition. Form 105 Committee Report on Petition for Initiation The report which is completed and returned to the Lodge Secretary prior to Balloting by the Committee of Investigation on a Petition for Initiation. Form 106 Petition for Affiliation This form must be completed in full and signed by the Petitioner and two brethren of the Lodge handling the Petition. It must be accompanied by a valid Certificate of Good Standing from the Petitioner's current Lodge(s) or a Demit from the last Lodge of which he was a member. 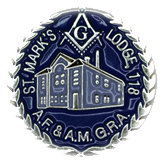 Form 107 Committee Report on Petition for Affiliation The report which is completed and returned to the Lodge Secretary prior to Balloting by the Committee of Investigation on a Petition for Initiation.